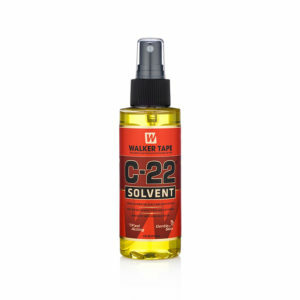 C-22 Citrus Solvent from Walker Tape is fast acting citrus based adhesive remover for scalp, wigs and hair systems. 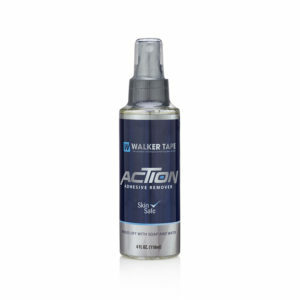 Action Adhesive Remover from Walker Tape, for wigs and hair systems, is the fastest skin-safe solvent Walker produces. It will cut through adhesive quickly and will leave very little oily residue. Duo tac Thin Tape Minis by Walker Tape are designed for easy clean up and has the dull finish of a lace front tape so is virtually invisible through the hair system unit reducing the shine effect. 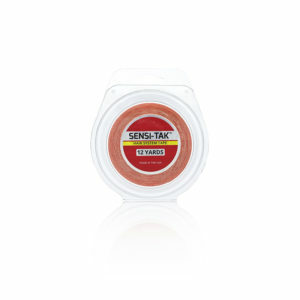 Great for use on poly and lace mesh units as they can be used effectively on either type. This is the thin low profile version of the standard Duo tac Tape – the same great hold and application but with a lower profile. Practically perfect in every way! Duo tac Thin Tape Minis are very popular with our clients as an extended wear tape, which can last for up to 2-4 weeks. 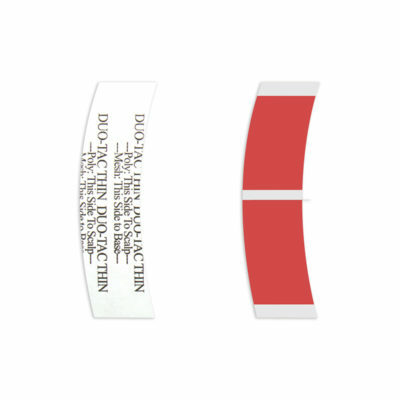 The Duo tac Thin Tape Minis, which are C Contour (slight curve) tape tabs in easy peel and apply sections, give all the benefits of a red liner and a blue liner in easy Mini tape format. Pack of 36 Duo-tac Thin Tape Mini (slight curve) tapes. 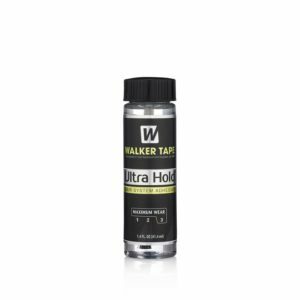 Walker Duo tac Thin Tapes Minis Manufacturer: Walker Tape – The leader in Hair Replacement Supplies. This tape was designed for easy cleanup and little residue with the dull finish of a lace front tape. Duo-Tac buyers swear by this tape. A very popular option with our hair extension customers. The liners are red and white but the actual tape is clear. If you’re looking for something with less oily residue, Walker Tape Action is a great option. It is the fastest skin-safe solvent we produce. It will cut through adhesive quickly and will leave very little oily residue. Hair System application, Hair Systems, Hair Loss Products and Treatments, Lace Wigs, Toupee and Accessories.